Perennial herb, up to 80cm tall, native to Northeastern China, Manchuria, Japan; taproot thickened, succulent, scarlet outside; leaves simple to odd-pinnate, leaflets circular to broadly lanceolate; flowers white to mauve or violet. var.miltiorrhiza: Leaves odd-pinnately compound; leaflets ovate or elliptic-ovate to broadly lanceolate. Used medicinally for coronary diseases. var. charbonnelii: Leaves simple, sometimes 3-foliolate; blades or leaflets orbicular to suborbicular. A dichloromethane extract of Salvia miltiorrhiza showed a pronounced inhibitory effect on recombinant monoamine oxidase A (MAO A) and on inducible NO synthase (iNOS) induction. 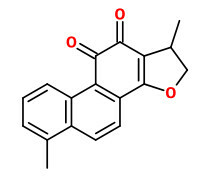 Four tanshinone-type diterpenoids (tanshinone IIA, 15,16-dihydrotanshinone I, cryptotanshinone and tanshinone I) were isolated. „The IC50 of the most active compound, 15,16-dihydrotanshinone I, on human recombinant MAO A was at 23mM, and 2.4mM on lipopolysaccharide-mediated iNOS induction in Raw 267.4 cells.“ In the MAO A and iNOS assays, tanshinone IIA was the least active compound. Danshen (Salviae miltiorrhizae radix et rhizoma) is used to treat menstrual disorders, abdominal pain, myoma, ulcers and carbuncles, restlessness, sleeping disorders, palpitation and chest pain. It should contain (PhEur 7.7): min. 0.12% tanshinone IIA and min. 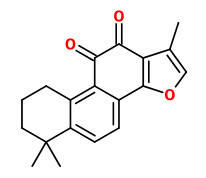 3.0% salvianolic acid B, (PhPRC 2010): min. 0.20% tanshinone IIA and min. 3.0% salvianolic acid B.